The simplest premise: one man likes getting wet, the other does not. The stage is a pool of water three feet deep. Begin. 'Ce n'est pas un spectacle,' says the man who introduces the show, to explain that O Temps d'O is the product of a brief residency in the Village de Cirque's primary-blue tent and not a finished work, but as often happens with works-in-progress it's the informal atmosphere, the incompleteness, the undivided attention to the raw possibilities of the simplest elements that make it such a charming and involving hour. In the pool of water, overhung by an arched rig like the skeleton of a bandstand, the two play out their roles, beginning with a joke where the two have instruments and their seats and sheet music are in the middle of the water. The one wades in, the other nervously skirts the edge and climbs the scaffolding. It's a slow start, but it adroitly builds the pitch and intensity of the slapstick (or the comedy of physically awkward and precarious situations – we need a word for that) before slipping into a scene of marvellous and sombre absurdity. Islanded on one of the chairs, the aquaphobe (William Valet) edges sidelong to the end of a ten-foot pole, held up by his wet partner (Mathieu Levavasseur) and recently used to a play at a distance a recorder fitted to the other end. On his head Valet wears a cymbol, like a wide-brimmed rain hat, which he flicks and plays as he slowly works his way across the water. Levavasseur has a Swiss hang, depending from the hook of a wide, leather weightlifting belt, on which he taps out a resonant, expansive tune – with the hang's special half-there quality, distant yet warm, evocative and faded – the pole for the time being braced across his thigh as he squats down. Reaching the end of the pole, Valet seems to lose his balance, is buffeted back and forth, spins quickly, holds Levavasseur, and kisses him on the cheek; then he returns. 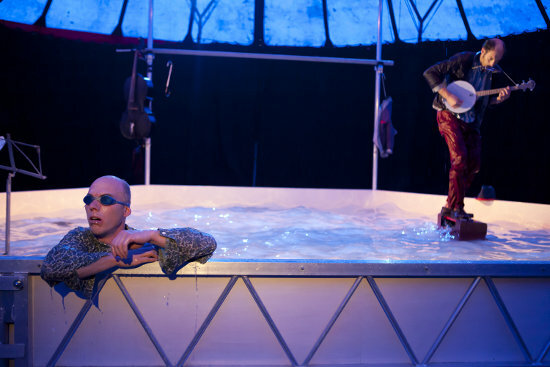 It shifts back to slapstick (or whatever we're calling it) as Levavasseur wears a diving mask and acts as base for an acrobalance sequence where Valet is clawing his way over him to avoid the water – Levavasseur is constantly being pushed down and submerged, and each gasp for breath as he rises and shifts is matched by a shriek of panic from Valet as he sinks down. Eventually Valet falls (massive cheer from the audience), and, of course, naturally, discovers that actually he loves the water, circuiting the pool, swimming every kind of stroke and porpoising edge to edge as Levavasseur plays a hearty tune on banjo and harmonica. After a cathartic bellyflop, Valet begins to duet with Levavasseur, scooping up loops of water that he slaps and explodes in rhythm, throwing spray to the front rank audience of delighted young children. Sitting there in the glowing underwater blue of the demi-transparent chapiteau, crammed onto closely laid wooden benches, it felt purely happy. The show (which is not a show) was a simple thing, but it's one of the modes that circus is best at: to take one idea and take it all the way. This one flew.